This year has been a hot one and residents are either enjoying their pools very much if they have one - or they're dreaming about putting one in. But did you know that you need to have a Pool Enclosure Permit? Here's a brief overview of what a Pool Enclosure Permit is and why you need one. This year, Council passed an update to the City of Ottawa's Pool Enclosure by-law. This by-law was established for safety reasons and requires that outdoor pools must have adequate enclosure so that children are not able to access the pool area. Every pool owner must obtain a pool enclosure permit, even if your yard already has a fence. This ensures that the existing fence is inspected to see if it meets the minimum requirements. Although a survey plan is not a minimum submission requirement, it is highly recommended. Incomplete applications or drawings will not be processed. There are minimum design requirements for height of the enclosure. The recent changes added the requirement that gates must be self-closing and self-latching. If the pool is not in use, gates must be locked. Existing permit holders are still considered compliant, except for locking the gate. The requirement for locked gates applies to all pool owners. What about above ground pools? Special consideration must be made for above ground pools. Minimum height requirements still apply, but depending on the pool design, the sides may form part of the pool enclosure. There are also considerations regarding the ladder/pool access design. I have a hot tub. Do I need a permit? Yes. If your hot tub has a compliant safety cover that is locked when not in use is exempt from the gate and fence requirements of the by-law. If you don't have a locked cover, you will need to build and maintain an enclosure as if it were a pool. In both cases, you are still required to obtain a pool enclosure permit. We want to use the pool, but construction isn't quite finished. You have the option to install a temporary enclosure. Once the temporary enclosure passes inspection, you can fill your pool for 14 days, but after that a permanent enclosure must be put into place. When do I have to have my pool enclosure inspected? If you're obtaining a temporary pool enclosure permit, you'll need to have an inspection prior to filling your pool with water and when your permanent enclosure is completed. I just bought a house with a pool! Do I need to get a new permit? Not necessarily. 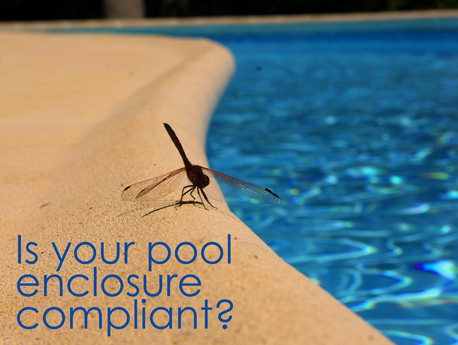 First, get a Pool Enclosure Compliance Report and that will tell you if your enclosure is compliant or not. We are building a beautiful deck by our pool. Do we need a permit? Decks are treated differently than pools. All pool owners need a pool enclosure permit. However, only decks that are greater than 10 square meters (108 square feet) need a separate building permit. Remember to "call before you dig" — contact the Ontario One-Call Service at 1-800-400-2255 to arrange for cable locates on your property. If you have questions about any of the information provided here, please contact the City of Ottawa to discuss with staff who can answer your questions - you can reach them through 3-1-1 (613-580-2400).